In 1946, when my brother, Michael, and I joined other children for several Saturdays at the imposing Protected Home Circle Building to practice walking down an aisle as pretend wedding participants, I don’t think we really understood what it was all about. On the day of the Tom Thumb Wedding, however, I’m sure I felt quite elegant when my mother tied matching ribbons in my hair and dressed me in a homemade pink chiffon gown adorned with flower appliques. My brother was decked out in a little tuxedo, also sewn by my mother, and probably wishing he were back home climbing trees in his front yard instead of participating in this curious ceremony. The Protected Home Circle (PHC), which sponsored the mock wedding, was a fraternal life insurance company founded in Sharon, Pennsylvania, in 1886. The company not only provided insurance benefits to families, but also sponsored social, patriotic, and religious activities for young people as a deterrent against juvenile delinquency. I recall my brother and I, at a very young age, attending ballroom dancing classes and watching a puppet show during a Halloween costume party in that massive four-story white brick PHC Building. In the lead would be the numerous bridesmaids in long dresses of a variety of pastel colors and styles escorted by groomsmen in black attire. Six of the bridesmaids, including a pair of twins, carried bouquets of flowers which must have ranked them higher than the rest of the bridesmaids. Next were the tiniest of the tots. First, the flower girl wearing a wide-brimmed hat and carrying her little basket of petals that she scattered on the bride’s path. She would have been accompanied by the ringbearer, distinguished by his white suit and short pants, and carrying the white satin pillow with the rings. Tom Thumb Wedding sponsored by The Protected Home Circle, Sharon, PA, Fall 1946. Michael Angel is in top row, directly between bride and groom; Ann Angel is third from right, top row. The bride did not hold a bouquet, at least not in the formal photograph taken afterward. Instead, it appears that she is holding a prayer book. The photograph doesn’t give much indication that we were enjoying the occasion, so maybe Mike and I were not the only ones who were just cluelessly playing our roles as we had been trained. After “vows” were exchanged and the photograph was taken, we filed out in the proper recessional order and then headed with our parents for the reception in a banquet hall. 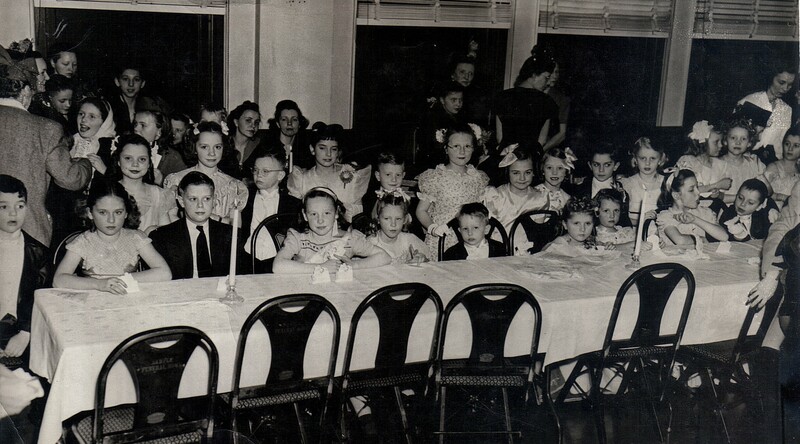 Reception following Tom Thumb Wedding, sponsored by The Protected Home Circle, Sharon, PA, Fall 1946. Ann & Michael Angel seated at table, 4th and 5th from left. 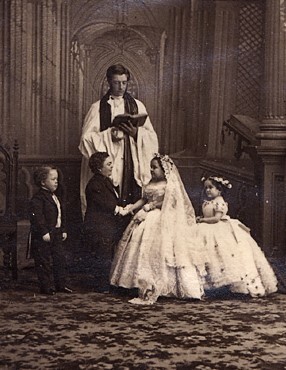 Marriage of Livinia Warren and General Tom Thumb (Charles Stratton), February 10, 1863, at Grace Episcopal Church, Manhattan, New York, NY. Tom Thumb weddings were originally inspired by one of showman P.T. Barnum’s many publicity events in the late 1800s. Barnum promoted popular museum attractions that included performances by the little person Charles Stratton, an actor whom Barnum renamed “Gen. Tom Thumb” after the English fairy tale character who was no larger than his father’s thumb. Barnum arranged and funded an actual wedding of Charles Stratton to equally minute Lavinia Warren in the winter of 1863. Their sensational wedding was a welcome diversion for the country during the dark days of the Civil War. Soon after, re-enactments of this diminutive wedding, featuring children, became popular as youth activities or fundraisers across the country and, after rising and falling in acceptance for over 150 years, continue to be held to this day. The Protected Home Circle Building has its own story. According to John Zavinski’s article, “Fraternal Group Rose From Ashes of ’36 Sharon Fire,” in the April 2011 issue of Life & Times, an original yellow-brick castle-like building of the same height was destroyed by fire on April 21, 1936, after just 33 years of existence. Exactly a year later, on the same East State Street location on the Shenango River, a cornerstone was dedicated to the construction of today’s art deco building. As of the early 2000s, after a change to mutual life insurance and a short-lived merger, the PHC company is no longer in operation. Today the building, now known as River Walk Place, is owned and occupied by Gilbert’s Risk Solutions, a venerable local firm that also sells insurance. Michael’s little black tuxedo also had a second life. Almost ten years after the Tom Thumb wedding, it was worn by my younger brother, Patrick, in Sharpsville’s annual Halloween parade and afterward in a costume contest that was held at Angel’s Casino. He was awarded the prize for wearing the Best Costume on Boy Under Six. Benjamin, Melanie. “America’s Royal Wedding: General and Mrs. Tom Thumb.” THE BLOG on Huffpost Style. http://www.huffingtonpost.com/melanie-benjamin/royal-wedding_b_850540.html (accessed 01-30-2016). Internet resource. Benjamin, Melanie. The Autobiography of Mrs. Tom Thumb: A Novel. New York: Delacorte Press, 2011. Print. Weeks, Linton. “The Wondrous World Of Tom Thumb Weddings.” http://www.npr.org/sections/theprotojournalist/2014/11/15/363787614/the-wondrous-world-of-tom-thumb-weddings. Internet resource. Zavinski, John. “Fraternal group rose from ashes of ’36 Sharon fire.” Life & Times, April 2011, page 22. http://www.zavinski.com/columnnowthen/pages/1104-nowthen.pdf (accessed 01-30-2016). Internet resource.